Lubrication: A Practical Guide to Lubricant Selection provides a guide to modern lubrication practice in industry, with emphasis on practical application, selection of lubricants, and significant factors that determine suitability of a lubricant for a specific application. Organized into 13 chapters, this book begins with a brief theoretical opening chapter on the basic principles of lubrication. 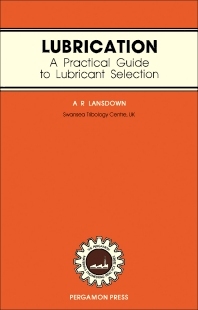 A chapter then explains the choice of lubricant type, indicating how to decide whether to use oil, grease, dry lubricant, or gas lubrication. Subsequent chapters deal with detailed selection of lubricating oils, oil systems, oil changing, greases, dry lubricants, gas lubrication, sealing, testing, monitoring, and handling of lubricants. The final chapter describes the main hazards associated with lubricants and some of the techniques for controlling those hazards. This book will be of value to technical staffs who use lubricants in their work; to students of mechanical, production, or maintenance engineering; and to others, such as buyers and storekeepers concerned with lubricants.